As knowledge spreads, wealth spreads. To diffuse knowledge is to diffuse wealth. To give all an equal chance to acquire knowledge is the best and surest way to give all an equal chance to acquire property. Constitutional statutes... which embody the settled public opinion of the people who enacted them and whom they are to govern- can always be enforced. But, if they embody only the sentiments of a bare majority…they are likely to injure the cause they are framed to advance. It will be the duty of the Executive, with sufficient appropriations for the purpose, to prosecute unsparingly all who have been engaged in depriving citizens of the rights guaranteed to them by the Constitution. Partisanship should be kept out of the pulpit... The blindest of partisans are preachers. All politicians expect and find more candor, fairness, and truth in politicians than in partisan preachers. They are not replied to- no chance to reply to them... The balance wheel of free institutions is free discussion. The pulpit allows no free discussion. The progress of society is mainly... the improvement in the condition of the workingmen of the world. 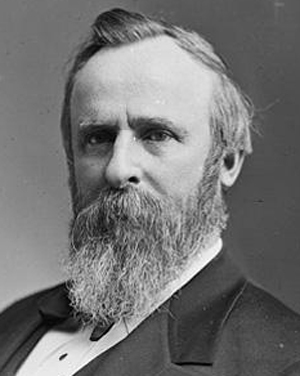 Rutherford B. Hayes: The National Hero of... Paraguay?